I was worried these were maybe going to be a little bit too much. Too much chocolate, too much sweetness, too much all at once, too much too close to Halloween candy hangovers -- but once they came out of the oven all I saw was mocha-y perfection. Delightful little mocha cakes with a soft centre topped with an Espresso Crunch marshmallow from Kimberley's Kitchen. Kimberley is BC's resident marshmallow queen. But to bring everyone more handcrafted marshmallow goodness, Kimberley needs to expand her kitchen. She could use a little help with fundraising to get the perfect workspace to bring her marshmallows to the people. 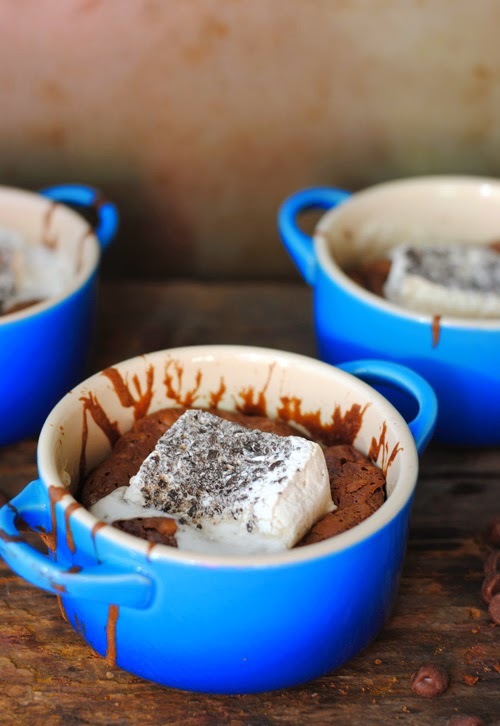 Check out how to donate here and keep on scrolling for the recipe for these gooey masterpieces. *This is a sponsored post, but my love for these delicious marshmallows is all my own. Preheat oven to 375F and grease three ramekins. Combine oil and chocolate in a small dish, and microwave on half power until the chocolate is almost melted. Whisk until smooth and set aside. Combine the remaining ingredients in a small bowl and mix until smooth. Add the melted chocolate and stir until combined. Spoon the mixture evenly into each ramekin. Bake for about 12-15 minutes, until baked around the edges and slightly soft in the middle. Add the marshmallow in the centre and bake for an additional 1-3 minutes. The marshmallow will just begin to melt. Remove and allow to cool slightly before eating.